When you work hard to build something that matters, you often wonder what is the impact. Since 2009, when we began as a campus organization and then later formed our own independent nonprofit, hundreds of people have put in tremendous efforts with the hope of helping good entrepreneurs become great and getting young companies off the ground. Today, as our 13th session wraps up with Demo Day, we can share a snapshot of our progress. We think it serves as a look back and as a glimpse into the future. Our first session kicked off in 2010. Since then, StartX companies have employed more than 2,000 people, creating over $78 million in revenue. These are the one, two, and 75 person companies that start in dorms, garages, labs, and our very own StartX HQ. 88.5% of our companies are still going strong, although that number is weighted by the fact that our last two sessions have been our largest so far. For our Fall 2014 cohort, we supported 38 companies. Over the summer that same year, we worked with 32. In the first five weeks of 2015, two of our companies were acquired. We’ve had 22 acquisitions since 2010. Last week, Pixelapse, which was part of our Summer 2012 session, announced they have joined Dropbox. The other acquisition deal has not yet been announced. Just 15 months ago, along with our partners Stanford University and Stanford Health Care, we launched the Stanford-StartX Fund. An unprecedented funding vehicle for early stage companies, it has quietly invested $31.4 million over 106 investments in a broad range of industries. 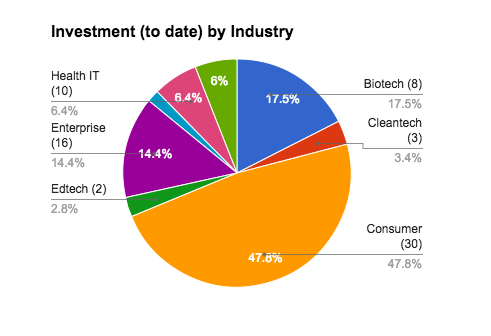 About 30% of those investments went into biotechnology and medical/health companies in StartX Med, the life science and medical division of StartX that launched in May 2012. Of those 49 StartX Med companies, 100% are still operating. Breakthrough, a telemedicine startup, was acquired in Fall of last year. StartMed companies overall have raised more than $172 million in funding with biotech as the largest sector in those raises. The fund, which is “opt-in” for StartX founders, and our program, has proven beneficial to startups of all stages. Rocketship startup, Life360, which is a connected hub for families, joined us for the Fall 2014 session. It is our largest company with 75 employees and more than 50 million families using their technology. With Life360, the Stanford-StartX Fund made its first series C round investment and we are excited to have them in our community. AmigoCloud – Mobile and Cloud GIS, enabling organizations to collect, edit, manage and share geo-data, online & offline, on web & mobile, and in real-time. Cleft – Two-factor authentication from the future. Farm Hill – crafting the future of healthy eating by preparing and delivering truly healthy, truly delicious meals. Haystack TV – empowers you to watch the news you care about with a personalized headline news channel. HeartThis – building the most convenient way to shop online by putting all your favorite stores in one place. Lightup – inspiring the next generation of innovators by making connected toys that adapt to kids as they play and learn. PayJoy – Consumer finance technology for emerging markets. Snitch – building Dropcam with professional monitoring, powered by the machine perception techniques behind the Stanford self-driving car. Summer Technologies – a sustainable agriculture startup transforming the $220bn beef and dairy industries with precision grazing management software. Switchmate – making home automation simple. ToneDen – a social platform for music that connects artists and the industry directly to their audiences. Vynca -is an enterprise healthcare network that is solving the crisis of end of life care by ensuring people get the care they want at the end of life. PredictionIO – an open source machine learning server for software developers to create predictive features, such as personalization, recommendation and content discovery.